The company is now equipped to measure ad fraud on OTT platforms. Given the rapid growth of OTT by consumers and marketers, there has been a need to measure OTT viewership and verify authenticity and impressions. Pixalate says it also received MRC accreditation for its OTT video ad impression tracking. Separately, it added high-risk OTT devices and IP addresses to its pre-bid blocking solution. The company uses a similar methodology in OTT to what it uses to track ad fraud on mobile app, mobile web and desktop platforms. The company’s analysis suggests that fraud rates on OTT devices average 19%, with marketers standing to lose as much as $10 billion in 2020 to fraud on the platform. Because of the higher bar for entry, and the quality of the video content available, OTT has traditionally been perceived as a safer place to spend ad dollars, compared to other platforms. However, no platform is free from fraud; the higher CPMs video advertising has makes for an appealing target for fraudsters. 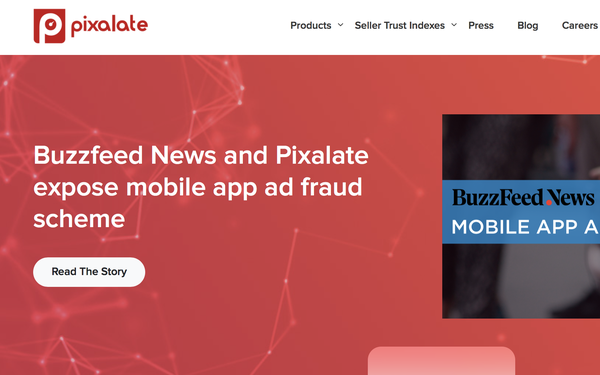 "While the OTT environments may not be as susceptible to some of the traditional invalid traffic in the sense of simple bots/spiders/crawlers, ad fraud is still a pervasive issue across OTT channels," Amy King, vice president, product marketing at Pixalate, tells Digital News Daily. She adds: "One exploit we are seeing used by fraudsters in OTT channels is the masking of fraudulent traffic through server-side ad insertion (SSAI) implementations. IP obfuscation is another common form of invalid traffic in the OTT. These are just a couple of exploit examples that contribute to the 19% ad fraud rates we see in OTT globally." One of the big risk factors affecting OTT is the decentralized nature of the platform and the relative lack of technical standards in the space. "There is no doubt it’s a promising, fast-growing new channel — we’re very bullish on its potential — but it’s currently decentralized and opaque, which makes it ripe for fraud," King says. "There are no central app stores comparable to what we see in the mobile app space, and new app stores are constantly popping up. "There are also no standard naming conventions for App IDs or Bundle IDs, which means different companies can have different names for the same inventory."